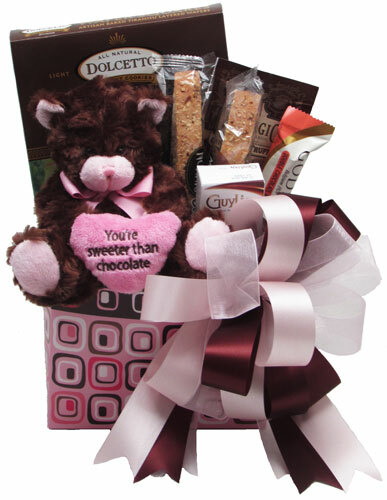 This delightful chocolate brown Plush Bear (6" sitting) is holding a plush pink heart that says "You're Sweeter than Chocolate"! It takes center stage in this design! Filled with Ghirardelli Milk Chocolate Squares with Caramel filling, Chocolate bottomed Biscotti (2), 2 Godiva layered Caramel Chocolate Bars, Cocoa, and a box of Chocolate filled Butter Wafer Cookies. Wrapped in crisp clear cellophane and topped off with a handmade bow. Includes a Handwritten Greeting Card. NOTE: The product list above details what is in the design. Some of the items in the photograph are no longer available.